A more competitive yield could make its stock more attractive. Graphics specialist NVIDIA (NASDAQ:NVDA) first began paying a quarterly dividend back in November 2012 -- more than six years ago. That initial dividend was just $0.075 per share, but over time, it has grown to $0.16 -- more than double where it started. Although NVIDIA has done a good job of steadily increasing its dividend, there are two problems that I have with it. The first is that NVIDIA's financial performance has significantly outrun its dividend (although I'd imagine anybody who bought the stock between 2012 and 2013 and has held on since then isn't complaining), and the second is that the company's current dividend yield -- which works out to around 0.43% -- isn't particularly attractive when it's compared to what other large-cap semiconductor companies offer. To that end, I think that when it comes time for a capital return program update, it'd be a good idea for NVIDIA to significantly increase its dividend. How much can NVIDIA afford to pay? Over the last 12 months, NVIDIA has generated more than $5.40 per share in free cash flow. The company's current quarterly dividend of $0.16 per share translates into full-year dividend payments of just $0.64, or just shy of 11.9% of its trailing 12-month free cash flow. If we compare that dividend payment to NVIDIA's expected non-GAAP earnings per share (EPS) for fiscal year 2019 of $7.23 and $7.22 for fiscal year 2020 (those are the average analyst estimates), then NVIDIA's current dividend represents less than 9% of the annual EPS that the company is expected to generate in both fiscal 2019 as well as fiscal 2020. Clearly, there's room to grow. Now, I can understand why NVIDIA might not want to pay out an extremely large dividend and commit a large portion of its free cash flow to the dividend -- some companies simply like to play it safe, so that even if they hit rough patches, they can continue their dividend programs uninterrupted. However, I think NVIDIA could make its dividend yield significantly more attractive while maintaining financial flexibility. 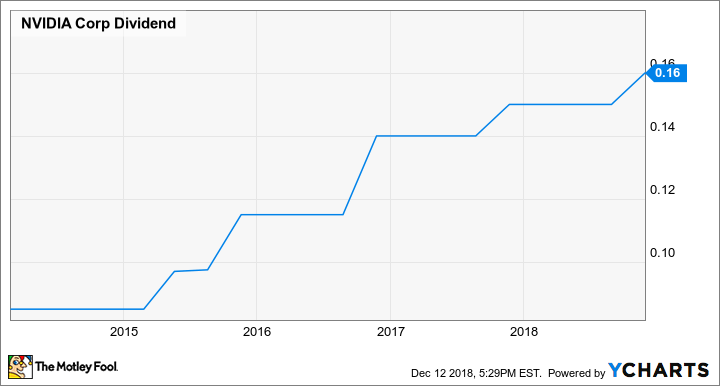 Indeed, if NVIDIA were to triple its dividend to $1.92, that payment would represent a little under 36% of the company's trailing 12-month free cash flow and less than 27% of the company's expected fiscal year 2020 EPS. This means the company would still have plenty of cash left over to do things like buy back stock or simply stash it in the bank while putting a bigger amount of cash into its shareholders' pockets. 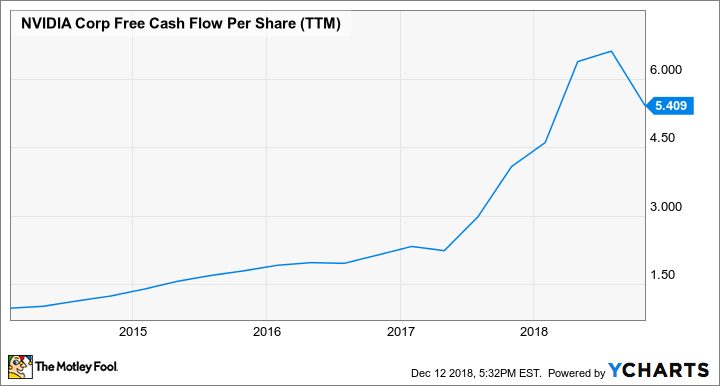 Moreover, even in a bad situation wherein NVIDIA sees a large reduction in free cash flow to, say, half of what it was over the last 12 months -- in other words, roughly $2.70 per share -- the company would still be able to cover that dividend. Now, I'm not necessarily suggesting that NVIDIA go out and triple the dividend all at once. Instead, I'd like to see the increases on a percentage basis be significantly larger than what they have been over the last couple of years, during which the dividend moved from $0.14 per share to $0.15 per share and then to $0.16 per share. That way, NVIDIA would be able to more gradually increase its dividend payments (giving it some flexibility over the long term to adjust those increases alongside its business performance) while at the same time accelerating the pace at which it grows the dividend.